Thousands of performances as renowned resident guest artists across the US, Asia, and Central America have given them a unique background that continues to serve as an example and motivation for their students. For those accepted, The Kintz-Mejia Academy of Ballet offers the unique opportunity for the uncommon tutelage of pure classical ballet. Linda Kintz was born in St. Louis and trained under Stanley Herbert, a former principal dancer of (American) Ballet Theatre. After moving to New York with a scholarship to the Joffrey Ballet School at 15 years of age, she joined Harkness Ballet Company and was part of its European tour. Upon return, Ms. Kintz received an invitation to join as Soloist with National Ballet of Washington (DC), directed by Ben Stevenson and Frederic Franklin. When it disbanded, she became Prima Ballerina of the Maryland Ballet in Baltimore, its youngest ever. As an accomplished professional dancer, prize winner of major international competitions in Varna (Bulgaria), Moscow, and Osaka (Japan), and the founder of The Kintz-Mejia Academy of Ballet, Ms. Kintz offers her extensive experience to young students interested in learning classical ballet in the Russian method. KMAB also incorporates her own system of teaching for pre-ballet levels, a unique approach that has rendered astonishing results. Mark Mejia, principal dancer, teacher, choreographer, and co-director of The Kintz-Mejia Academy of Ballet, brings a wealth of experience and professional knowledge. 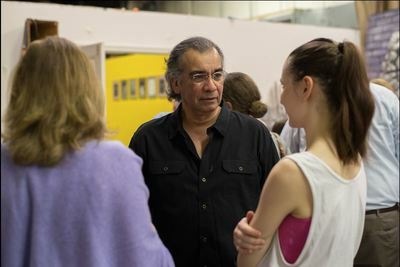 In addition to upper-level student training, which includes all aspects of ballet technique, pas de deux, and character dance, he has staged and choreographed a long list of productions for the Academy as well as other schools and professional companies. He was born in Los Angeles and studied under Stefan Wenta, former premier danseur and choreographer of Warsaw’s National Opera-Ballet. At age 18, he joined Pittsburgh Ballet Theater and was promoted to the rank of Soloist after one year. From Pittsburgh, he joined National Ballet of Canada, touring with Rudolf Nureyev and Erik Bruhn. After making his debut in Le Corsaire with Boston Ballet, he was invited to perform with numerous companies and organizations. During his entire career as a dancer and choreographer, Mr. Mejia has dedicated himself to the pursuit of learning, understanding, and applying the Russian ballet pedagogy. Ballet is not dance, nor is it an art of self-expression. Ballet is a language. Ballet is an act of self-mastery. I teach classes to students from about age nine to adult. One of the first things I tell them is, “Ballet is not dance, nor is it an art of self-expression.” Ballet has been lumped together with what we call dance. So many studios, even those with ties to professional companies, can’t tell the difference. Just because we move to music does not make ballet, dance. Ballet is a language. Complete with its own vocabulary and grammar. Yes, there are times when other dance forms are used in the context of a work. Today, all movements are there to be used, but once performed by a well-trained ballet artist, it is no longer a folk dance or modern dance movement. Ballet speaks to its audience; it does not merely excite them with sensual or sexual gestures. The repertoire of the classical ballet might seem funny and old-fashioned to some, but it does not to those who have the cultural background to appreciate it. The classics serve to preserve the purity of form and style, which is the essence of all “classical” art forms. To perform “Sleeping Beauty,” for example, one must possess perfect technique and develop what might be called a French style with every nuance. The story may seem a bit insipid, but it is not about telling the story, it’s about the dancing. The perfection of anything is often called an art, which leads us to training. In the realm of classical dance, the aspect of perfection is what leads us to ballet as an art. In classical ballets, the interpretation is always within a certain context. The acting is not similar to what is seen in plays or movies. Classical ballets are like poems that reveal a feeling in the stated word. When reading a poem, the meter and rhyme create an altered mental state that seems to reach us emotionally, one which we already perceive. We have dramatic contemporary ballets that reveal so much more emotionally, especially when we see a pas de deux where the two bodies seem to develop such a statement about their characters, when supported by the music. But the classics (e.g., Swan Lake, Sleeping Beauty) require perfect technique, unlike any other choreographic form of the western world. It is that quest for perfection, not self-indulgence of artistic endeavor, that makes this or any art form worthy of serious study and acknowledgment. I’m disappointed, at times, that many people don’t realize that ballet is an act of self-mastery. Sometimes it’s compared to sports, because of the physical development and high level of energy needed. Nothing could be farther from the reality of it. Some mothers bring their daughters as young as three years old to start them in ballet class, thinking they will gain poise and grace. The word "graceful" is not even used in the process of a ballet class. Other misconceptions abound. There was a time that I had agreed to give ballet classes at a skating rink. They had competitive skaters, and I suppose they had seen skaters from other countries like Russia with beautiful arms and a manner that only dancers have. So they decided to get a ballet teacher. After a few classes, one of the head instructors came to me and said, “We want you to help them have better arms and to be more graceful. Please don’t work on turnout so much.” What stupidity! Just like the mother who enrolls her three-year-old child into ballet to gain grace, they were after the residual effects of having studied ballet. We don’t teach arms, we teach the entire body and mind. You cannot have good arms without turned out legs. You cannot have aesthetic beauty of any kind unless the entire body has harmony in its poses and movement. The study of classical ballet is the study of position. Dances are like animated movies that, in reality, are a series of drawings, which, when strung together, give the impression of movement. I must say that American ballet does, as a result of having no real school, try to develop a kind of sinew and sensitivity, though often not supported by technical correctness. This is not to say that only classical ballet is an art or that only classical ballet should be presented. To the contrary, all art, be it classical or pop, is a reflection of our society or the values of our society. Classical ballet, when pursued with truth, reflects our human nature’s desire for the ideal. Contemporary ballet, like contemporary art, reveals the inner landscape of its creator. This isn’t to say that we don’t need these works (we do); however, there is a danger that this work may not exist for the purpose of enlightenment but rather self indulgence. A beautiful song may tell a personal story in the hopes that others might relate and, at the same time, demonstrate the composer's talent, but if the song is composed simply because the singer/writer loves the sound of his own voice, then this is false art. We could also say that false art is likened to amateurism, where only the performer is intended to enjoy, even while the audience suffers. Since the ballet boom of the late sixties and seventies, ballet has slipped into the world of our pop culture. Our prominent dancers are those with remarkable physical aptitude for ballet technique, not for their command of the ballet stage. Swan Lake has become a “whopper.” Though not inexpensive, it certainly contains the nutrients we need from our arts and is heavy in fatty crowd-pleasing, not crowd-enriching, execution. Of course, after every performance, the entire audience stands to applaud the spectacle, determined to have gotten their money’s worth, but one step farther from realizing what could be presented and what was experienced in the days of Rudolf Nureyev, Vladimir Vasiliev, Maya Plesetskaya, Natalia Makarova and Mikhail Baryshnikov - a time when technical prowess met cultured artistic control. If we dub someone a Ballerina or a Danseur Noble, by what means can we validate this view? Antony Tudor, in the “Ballerina” program produced by Natalia Makarova, stated that in order to be a ballerina, one must perform Swan Lake, Sleeping Beauty, and Giselle perfectly. I agree completely. These ballets are examples in which all the training and study culminate. Technique, control, a large dramatic spectrum, and, of course star quality comprise the prerequisites of being able to perform these works with true academic purity. Now, we have choreographers who put in our face how little we actually have come to expect from the performing arts. Childish choreography formed on music that should insult our intellect is now sought after, thinking this might serve as some kind of outreach tactic. The popular view is to build audiences by being attractive to the ignorant. It would be my wish that audiences were given a chance to know what power and beauty truly lie in a ballet performance when presented with detail by enlightened artists on both sides of the curtain. Don’t most good things in this world that are not needed for survival, but rather for psychological or philosophical enrichment, require a developed taste? Give 100-year-old cognac to someone who’s never had it, and they will probably not be able to appreciate it, because their palate is insensitive to the nuances that a connoisseur would easily detect. I do believe that classical dance with all its refinement, would thrive if the standards were raised. Even MacDonald's, which is a business whose sole purpose being to make money, is becoming aware that nutrition is now a popular consideration and has begun adjusting its menu.